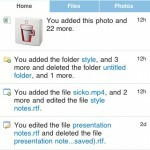 As Dropbox gets closer to launch, new features keep popping up. I have been hoping for a mobile version of the site for a while, but didn’t realize until I popped into the Dropbox forums this morning that one already exists. I’m not sure how long it’s been up, but I imagine it’s relatively new. When you go to www.getdropbox.com (use https:// for a secure connection) on your iPhone or iPod Touch, the site automatically detects that you’re using Mobile Safari and loads a mobile version of the site. The interface has three tabs: a Home tab that shows you recent account activity (with thumbnails), a Files tab that lets you dig through your folder structure, and a Photos tag that lets you access your photo galleries, complete with thumbnails and full-screen photo view. 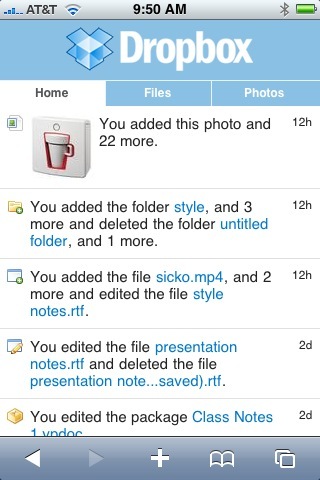 Dropbox has a great mechanism for sharing files. When you drop files into your “Public” folder, the files are uploaded to the Dropbox servers and given a unique public URL that can be accessed by anyone, without needing a Dropbox account and shared folder access. I use this all the time for sharing screenshots or quick mockups of projects I’m working on, or pretty much any other file I’d typically e-mail as an attachment. The only thing really missing, to me, in the mobile version of Dropbox is access to this public URL. I’d like to see a link along the lines of “e-mail this file”, where the site would dump the file’s public URL into a blank message in Mail.app. This small addition (that I’m confident we’ll see) would really round out the functionality of Mobile Dropbox as I need it. I haven’t loaded the site up on my Windows Mobile phone yet to see if there is a PocketIE friendly version of Dropbox yet, please leave a comment if you have any info on this. If you haven’t made it into the Dropbox beta yet, don’t worry, because it looks like it will be going public any day now! Iphone does not give me the mobile interface. What good be wrong?! 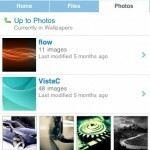 What is the link for Dropbox mobile version? 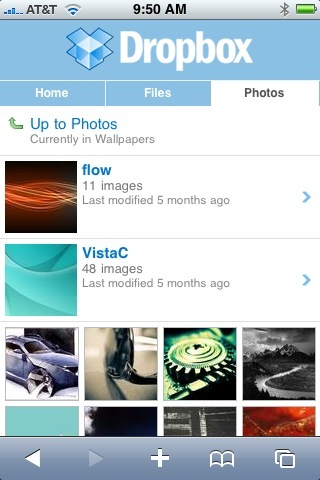 http://www.getdropbox.com/iphone/ is what my phone goes to when I go to the normal URL. I’m not sure if there’s a more standard mobile version. Hope that helps. http://www.getdropbox.com/iphone/ is what my phone goes to when I go to the normal URL. Iâ€™m not sure if thereâ€™s a more standard mobile version. THANK YOU I WANT YOU MOBILE VERSION!